In 1915 a surveyor for the Canadian Pacific Railway chose a name for an area in Alberta, Canada. 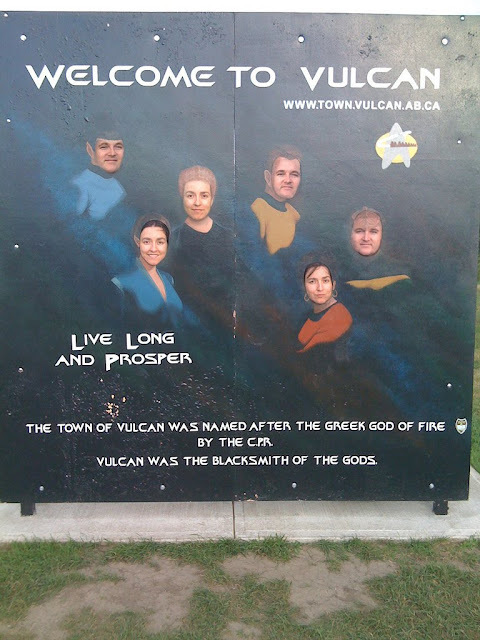 The place must have reminded him of the gods of Roman mythology as he chose the name Vulcan, after the god of fire. He had no idea the favour he was doing for the future generations of the town that would spring up around the railroad. 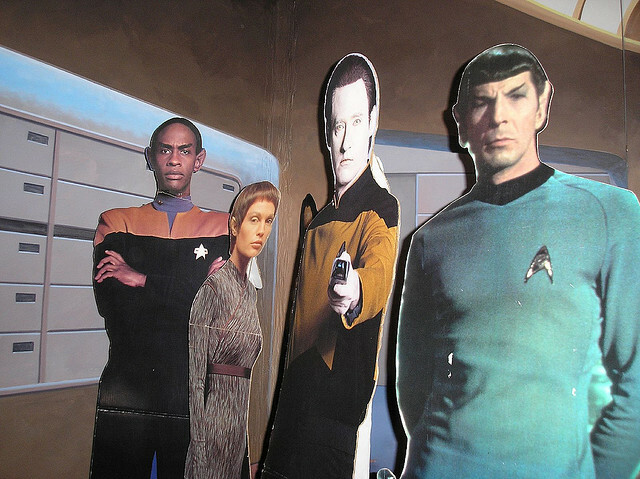 Fast forward to 1966 and a new TV show, Star Trek, made its debut on the NBC TV station in the US. 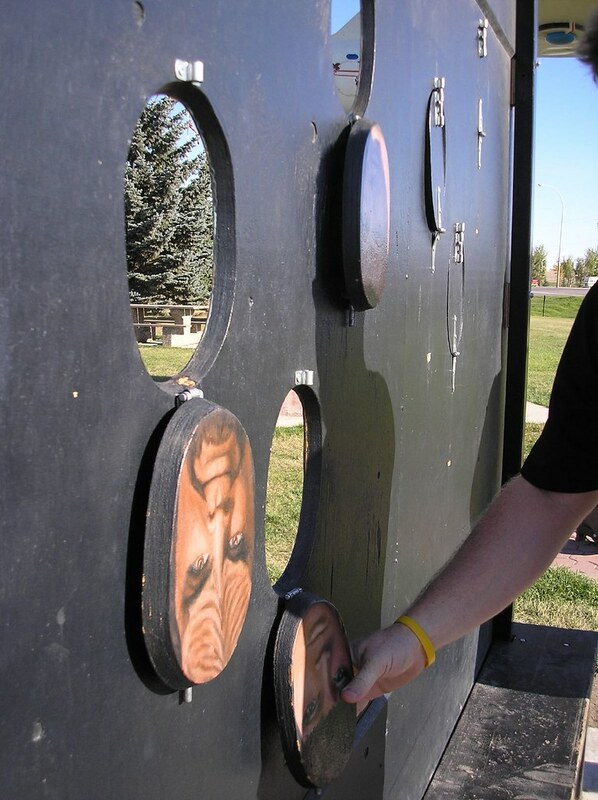 The Vulcans of Alberta discovered that they had a twin, but not a town, an entire planet. 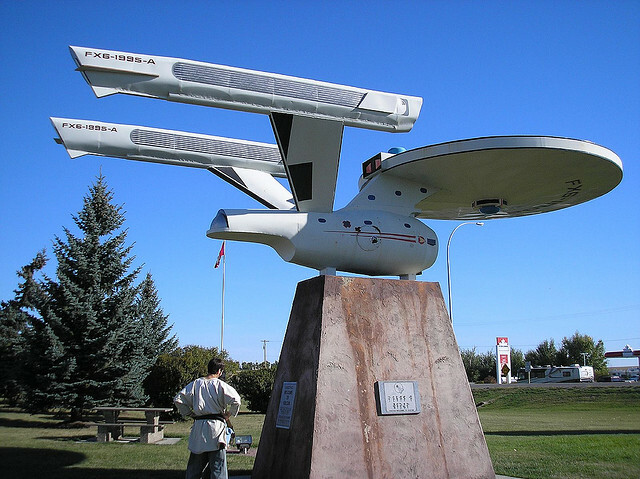 That being the case, the temptation was too strong - and the town has several Star Trek themed features which are worth a look. Or two if you are on shore leave. 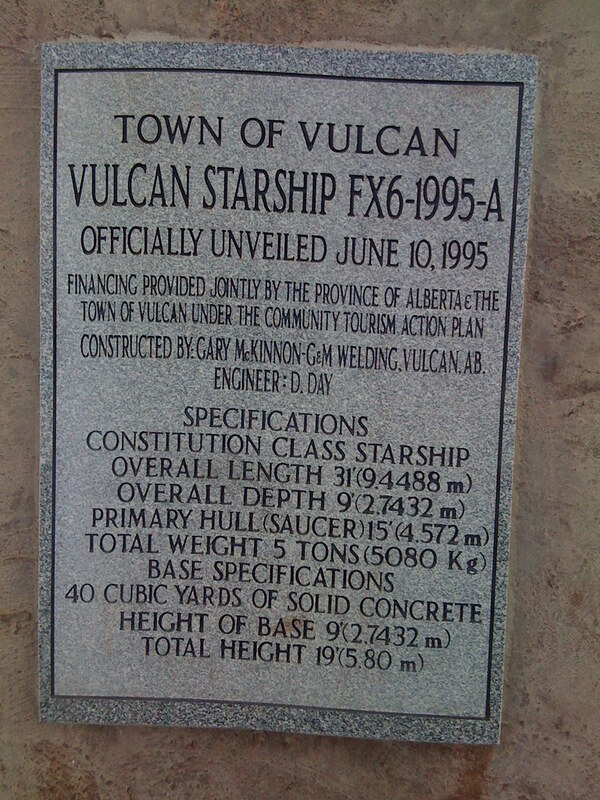 The visitor center of the town is not so much a Vulcan citadel as an outpost but it is sufficiently out of place to convince the unwary (or gullible, choose your adjective) visitor that the Vulcans arrived in Canada at least a hundred years before Zefram Cochrane forced them to get drunk and listen to rock music in 2063. The town had to go something of a metamorphosis over years as economic circumstances changed. 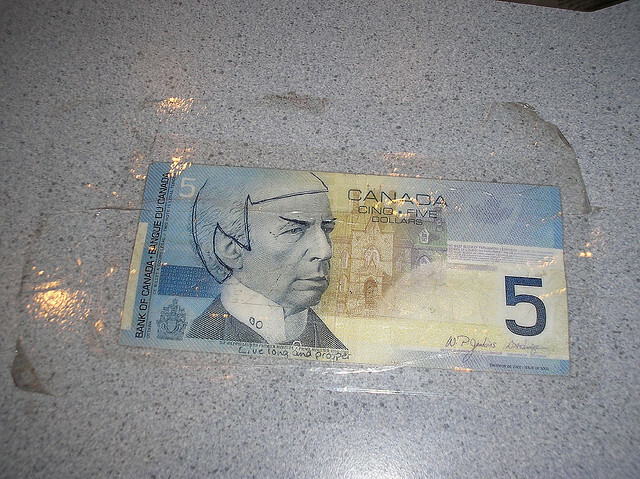 A more than cursory glance at the local currency and your fears are confirmed.Is that Sarek? The home world of Mr Spock, fictional Science Officer (sorry, but he is) on the USS Enterprise is of course also called Vulcan. 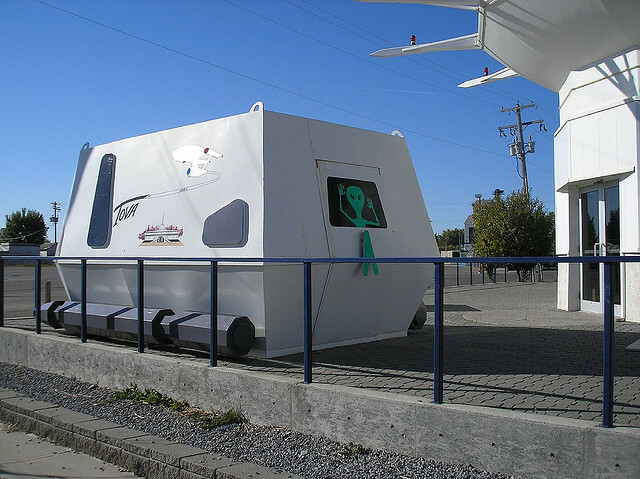 A burgeoning fan base and some enterprising townsfolk meant that this coincidence would leave its mark on the small town of just over 1,000 people. It may feel like a city on the edge of forever, but there is more to it than meets the eye. The town has a long history of hospitality and so visitors are made to feel welcome - in their own languages where possible. If you thought that some South East Asian scripts were difficult, the Vulcan script shown here must take some learning. Good job they live a long time. 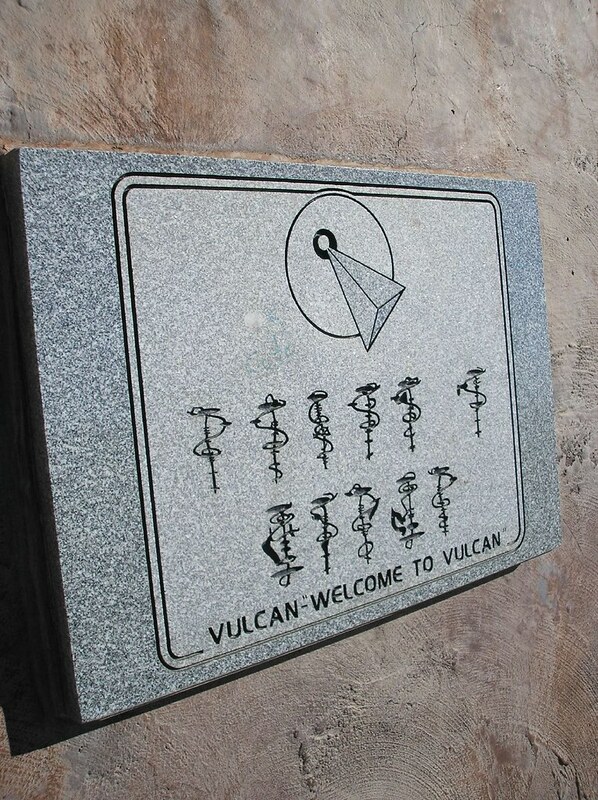 There is also a plaque in Klingon - confirming this journey to Babel - which says What do you want. Always ready for a piece of the action, the Klingons. 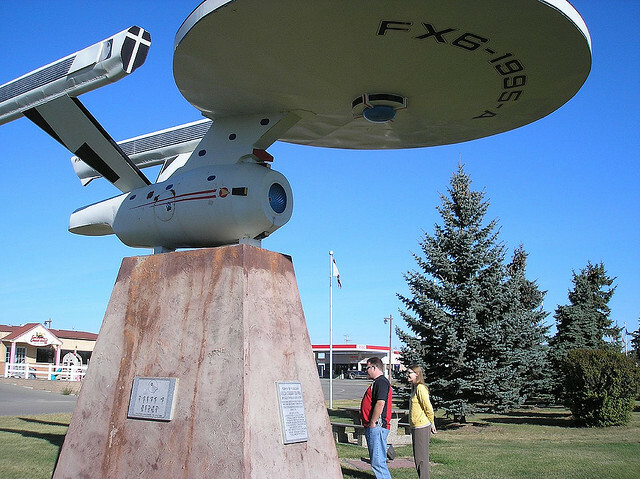 The center piece of the town's homage to the show is the model of a Federation Starship. It bears insprection, but possibly not close up. It is not quite the right configuration for an original series ship, but not modern enouph for the Next Generation. What the heck, though - can't people create their own mythology? By any other name, the ship is instantly recognizable. The town, due to its sheer size (or lack of it), had very few other claims to fame. A picture of the 1927 tornado which virtually destroyed the town featured on the main article of the Encyclopædia Britannica page on the weather phenomenon. It was also famous for its many grain elevators, but as agriculture declined in the area they were removed (historically, almost in the wink of an eye) until today there is only one left. 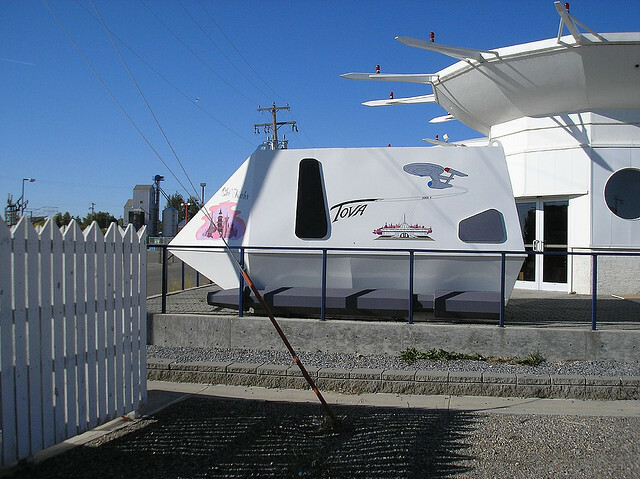 Star Trek, then, is an important feature of the town’s ability to attract visitors. 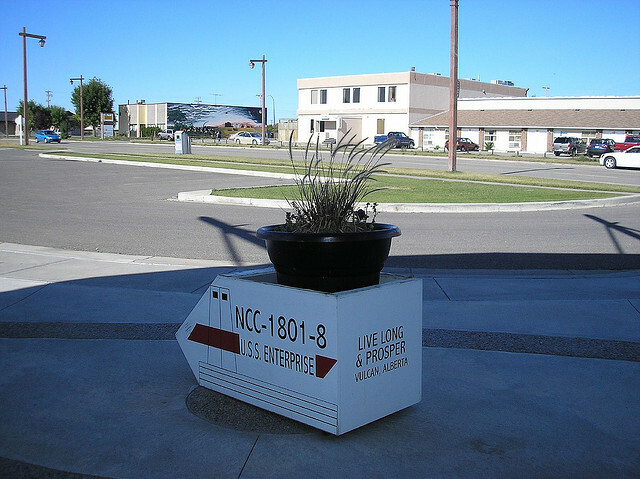 Yesterday's enterprise may be gone, but there are always others to be found. 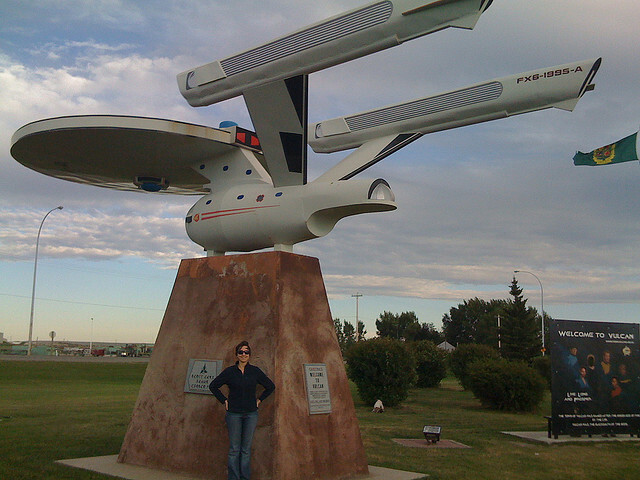 However, Vulcan is much more than a large model of s Starship. If you have ever been on a pier you may already have guessed what the above is, albeit with a distinctly United Federation of Planets twist. If you are a fan, you feel like you are on home soil. Image Credit Flickr User JefferypriebeChoose you character and pop your head in the hole - get the poor unfortunate camera owner to feel even more left out and socially outcast than they already do and you have memories and a memento to show the grandkids. 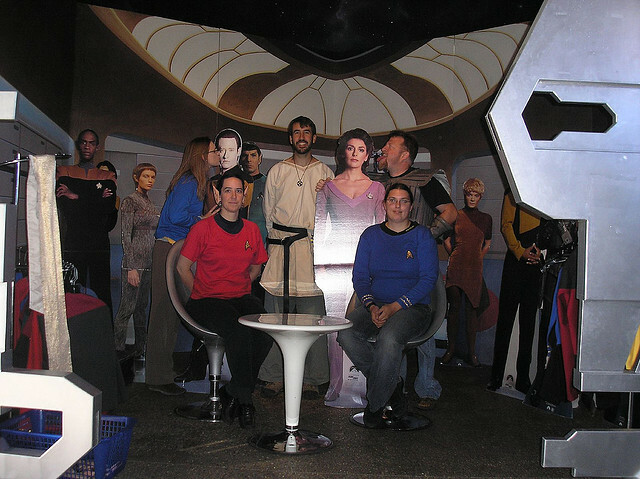 Once you are inside the vistor center you can have even more fun - by dressing up as your favorite character. Then you get to have your refreshments amid a host of characters from the shows. There's hours of fun to be had, kissing Data and licking Troi. The exhibit may not have cost a million dollars but in the mind's eye you can be at a food stall at Farpoint and that is all that matters. It's all in the eye of the beholder, after all. A little persistance of vision and you are there. 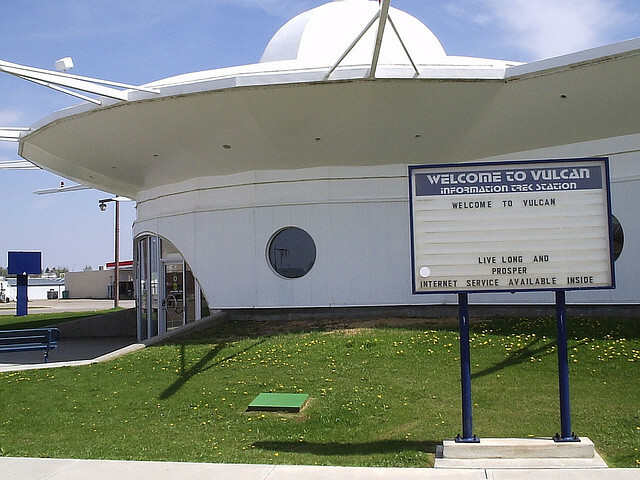 Perhaps the best Star Trek features of the town of Vulcan, however, are the shuttle crafts. Again, we are not too sure which model from the TV series it is supposed to be modelled on, but we suspect vis a vis the panic-stricken Asgard in the back that there may be a little crossover technology (or at least inspiration) going on here. 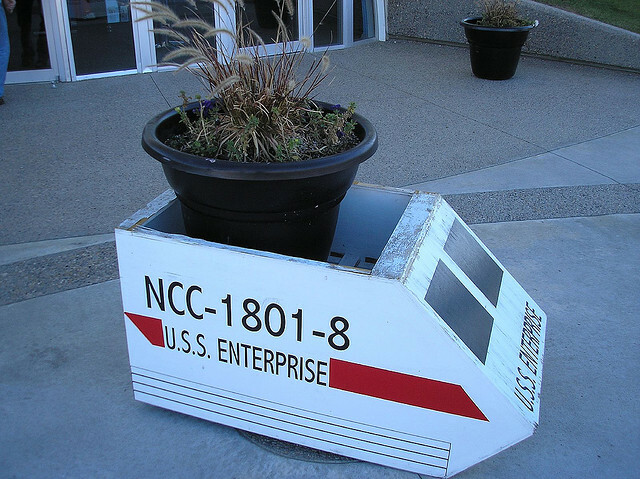 Possibly, no, probably the best Star Trek inspired constructs in the entire town are the shuttle craft planters. 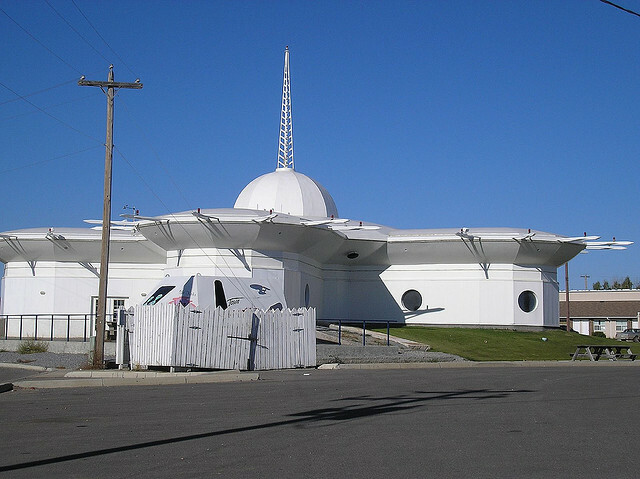 A work of sheer genius - and most likely indicating extraterrestrial involvement. No human could come up with a concept this sophisticated, surely, they don't have the right fram of mind? Yet, every home should have one.